Nobody wants a slow website. However, as we go about populating our site with rich media content, it will inevitably slow it down. So how to handle this situation? Well, if you have a WordPress website, then there are WordPress Caching Plugins which can help you out of this mess. A caching plugin will enable you to store recently accessed information on your visitor’s hard drive. Hence the next time they visit your website, their browsers won’t have to retrieve the information from your server. This can dramatically improve load speeds. We have researched and put together a list of the best WordPress Cache plugins for your use. Not only will they help to keep your site running smoothly, but also help with SEO as well. As you should now, site’s with low load times have a better SEO performance on Google. The plugins can save dynamically generated HTML files in the cache. The next time the user comes to your website, the browser will sever the files stored in the cache instead of reloading all the scripts from WordPress. This reduces server load, which ultimately improves loading speed. WP Super Cache is another famous and influential caching plugin for WordPress. The main highlight of the plugin would be its extensive list of features and how quickly they can be managed to improve your site’s performance. This WordPress cache plugin works by generating a static version of all your dynamic HTML files from your WordPress blog/website and caches them. However, do note, that this method limits the plugin from caching all the WordPress PHP scripts. And so, the plugin is mostly suited for websites dependent on HTML and not too much on PHP. Easy Page Compression with Dynamic Caching Options. A Scheduler for managing deletion and re-caching in intervals. Legacy caching mode allows caching pages for users who are logged in to your website. Starting off our list, we have W3 Total Cache WordPress plugin. 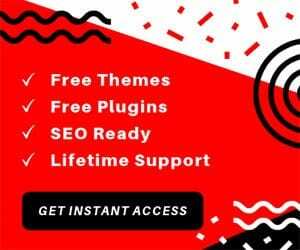 However, most people consider it to be a WordPress performance optimization framework thanks to all the advanced features it brings to the table. W3 Total Cache is also one of the most popular caching plugins for WordPress. All its features work together to help your site load faster, deliver a better user experience, and optimize the site’s overall performance. The plugin also comes with a dedicated Content Delivery Network or CDN management. Gets to work right out of the box with well-optimized default settings. Multiple settings organized and arranged into 16 pages. Plenty of customization options to help you fine-tune how the plugin works. WP Fastest Cache, as advertised in the name, is the fastest caching plugin for WordPress websites. 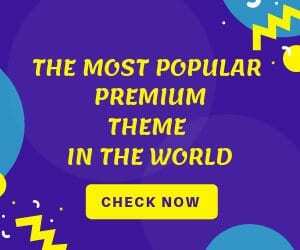 It is also super easy to use and offers one of the most straightforward WP cache plugin in the market. Immediately after installing the plugin you will notice an improvement in your site’s load speeds. Much like WP Super Cache, here also the plugin functions by generating static HTML files for all the dynamic content on your WordPress blog/website. Uses Mod_Rewrite to create static HTML files. Option to delete all cache files one a new post or page is published. Option to deactivate caching for specific posts or pages. Comet Cache is a powerful caching plugin for WordPress made available for free. Once installed, the plugin starts to work in the background where to takes real-time snapshots of various website content for building cache. These are then stored intuitively for being referenced later which can help boost your site’s loading speed. 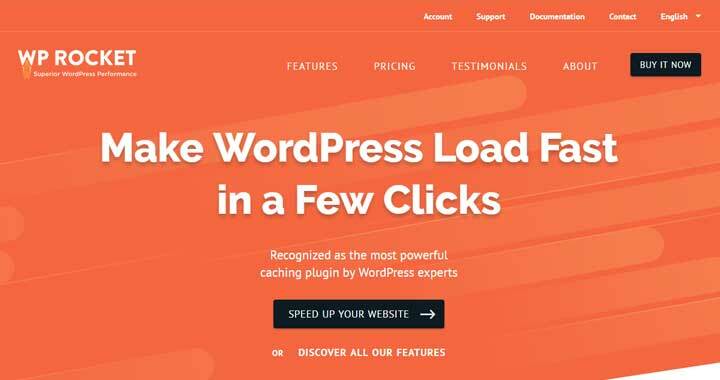 This WordPress cache plugin also features a lot of options which can be configured to help you control all the features of the plugin more effectively. And speaking of features, here are some notable functionalities of the plugin which includes features like URI exclusion patterns, user-agent exclusion patterns, the configurable expiration time for cache files, client-side caching, Apache Optimization to enable GZIP Compression, and much more. All the above functionalities can be accessed with the free plugin, but in case you are looking for some advanced options, then there is a paid version of the plugin available as well. Some of the advanced functionalities include domain sharing, server load monitoring, Apache Optimization, an option to clear Markdown-related cache files, and much more. Now if you don’t know, WebP images are extremely small sized lossless compression options. Hence you can see how it can help to improve load speed. It can also generate static HTML files and cache them for quick access. A fast and efficient disk cache engine. Option to see the actual cache size right on your dashboard. Support for WebP as mentioned above. Hyper Cache WordPress plugin has been developed to handle your website cache in such a way to provide maximum speed for your website. This WordPress cache plugin is developed using purely PHP and is made to work even with minimal resources. There is no need to get your hands dirty with too many complex configurations. Just install the plugin, and it will handle everything for you. It can help your site load faster both on desktops as well as on mobile devices. The plugin uses double cache for the desktop and mobile version of your website. On top of that, it will serve expired pages to bots which will increase the perceived blog speed, giving you a better SEO score. Other features of this WP cache plugin include the option to manage compression for non-cached pages, an option to cache pages for visitors who previously commented on your site, dedicated controls to clean cache on blog events and much more. You will also get bbPress integration, CDN support, HTTPS support, and many more special options. Simple Cache comes with a simple catchphrase of keeping it simple. People who run WordPress websites generally don’t come from a coding background. Too many details about compression, caching can be somewhat confusing. And so to address this specific audience, we have the Simple Cache WordPress plugin. It doesn’t overdo with too many options and functionalities. All the user is required to do is simply install the plugin, and it will immediately get to work. The user won’t have to mess their heads into a complicated array of settings and choices of what functionality to turn on and what to turn off. Inbuilt features work to improve site load speed. Option to delete some of the cached files. For the first entry on our premium WP Caching plugins list we have WP Rocket. Being a premium plugin, it comes with an extensive list of features – so many that you might get overwhelmed. However, the plugin also addresses this issue by arranging all the features in neat layouts to increase usability. It is currently one of the most powerful plugins for caching WordPress websites. From the moment you install the plugin it will start its magic, so you don’t necessarily have to meddle around with all the complicated options. However, if you like tweaking, you have unlimited freedom. GZIP compression as well as minification and concatenation functionalities. Borlabs Cache is a WordPress superfast caching plugins you can get for your WordPress website. In fact, the plugin is advertised to be capable of optimizing your WordPress site to load in milliseconds. One more aspect to note about the plugin is that it has been specially designed to help e-commerce website which gets too heavy will all the images and other flashy content. Option to delete caches after a set time period. 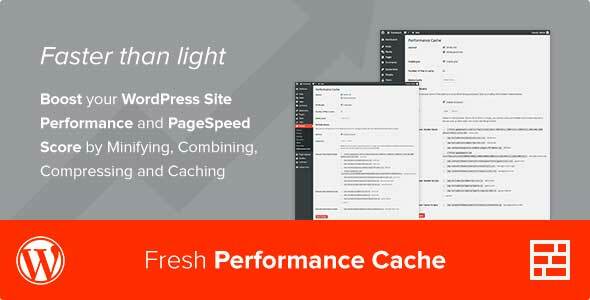 Fresh Performance Cache is yet another caching plugin for WordPress which aims to improve your site’s loading speed, overall performance, and promises to do so through its easy to use options. The plugin mainly relies on minifying, combining, compressing, and caching your files to help improve the load time. However, there are plenty of other features you get with it. Intelligent combining of cached files. Cached files are combined together in their original order. A white label admin panel that leaves no advertising or branding. And now coming to the final entry on our list we have the Fast Google Cache plugin for caching WordPress websites. Being a premium WordPress caching plugin, it is however priced very competitively concerning the other options on the least. But on the flipside, it packs in a variety of features to help improve your site’s performance. In fact, the plugin banks on providing easy management with enabling users to improve their PageSpeed. Reduces HTTP request time as well as server response time. Any other WordPress Cache Plugin? So these were our picks for the top 10 WP Caching plugins for WordPress. We hope you found this information to be helpful, and if you did, don’t forget to share it along with your friends. Also, apart from the ten, we have mentioned here, there are plenty of other caching plugins for WordPress which can be equally good. As far as our testing and discretion, these were the best of the bunch. However, if you think some other plugin should have made it to the list then do mention them down below. Your fellow readers will love to learn about other alternatives.